Many pop tarts, more than I care to admit, were consumed over the course of my adolescence. My brother and sister and I would often eat them for breakfast during the school week, or for an after-school snack, arguing over sharing our favorites with each other if supplies were running low (at the time, my favorite was Frosted Strawberry with Sprinkles). And then in college, there were the dormitory vending machines with my newly discovered favorite flavor, Brown Sugar Pop Tarts. On many days, in between rushing to work or classes or the library those would be breakfast or dinner – or even both. Jamie told me that years ago he had a weakness for S’mores Pop Tarts when they first came out and used to eat them every day at work until he managed to break the habit. I’m still surprised that the S’mores flavor was his favorite, since he’s not a big fan of marshmallows. There was a method to eating them that I never strayed from – I’d eat the dry, crusty edges first, and save the gooey, frosted center for last. A warm, toasted Pop Tart was always better than a cold one. 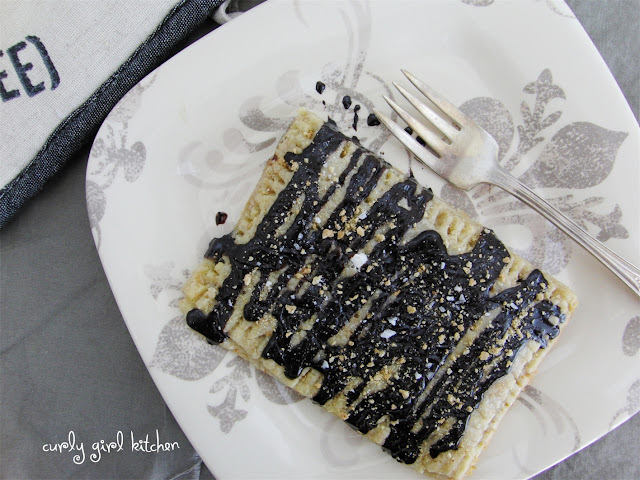 It’s been years since I’ve eaten a Pop Tart – thankfully my Pop Tarts for lunch and dinner days are over – and I’ve been promising Jamie that I’d give a homemade version a try, so one weekend I started with the brown sugar variety. With some leftover pie dough that I needed to use up, these were easily assembled with squares of dough and a simple filling of butter, brown sugar and cinnamon. 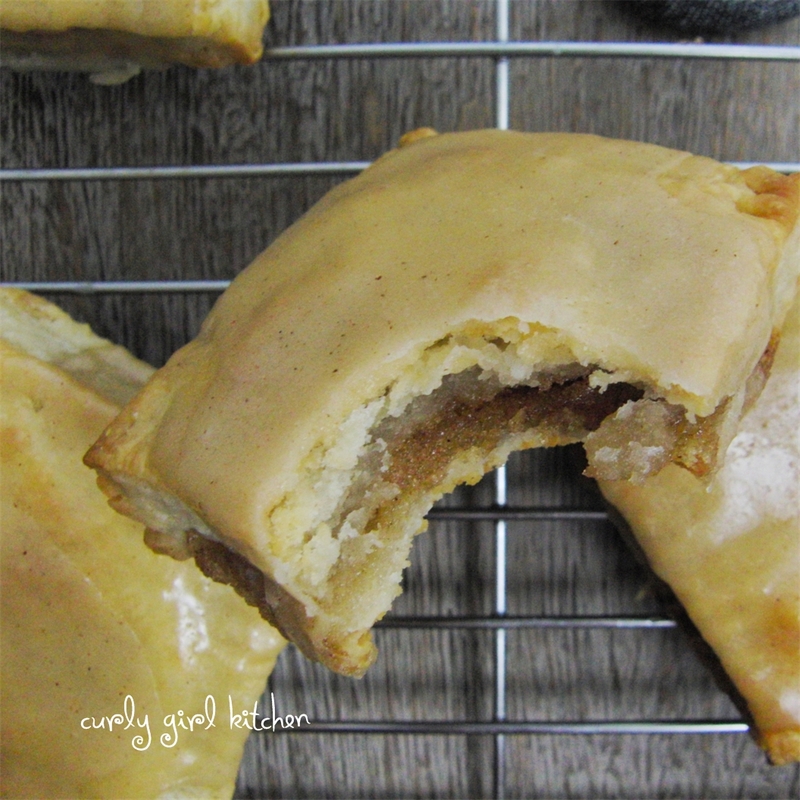 They baked up golden and flaky and really had that buttery, brown sugar flavor that I remember so well. When I made the S’mores version, I thought I would try using shortbread dough, to compare to the result of pie crust. I made a graham cracker shortbread, filling it with stripes of marshmallow cream and chocolate ganache. I found the marshmallow cream absolutely maddening to work with, as it wanted to stick to everything – the piping bag, my fingers, a knife – except for the dough. Eventually, I got it on there, but not without wanting to pull my hair out first. I realized after I was beyond the point of frustration that a little water helps keep the stickiness in check. The shortbread dough was much more delicate than the pie crust when these were hot, although they firmed up nicely as they cooled, so I had to handle them very carefully so as to not break them apart. They were also very rich, and a whole pop tart was a little too much, so these can easily be shared. 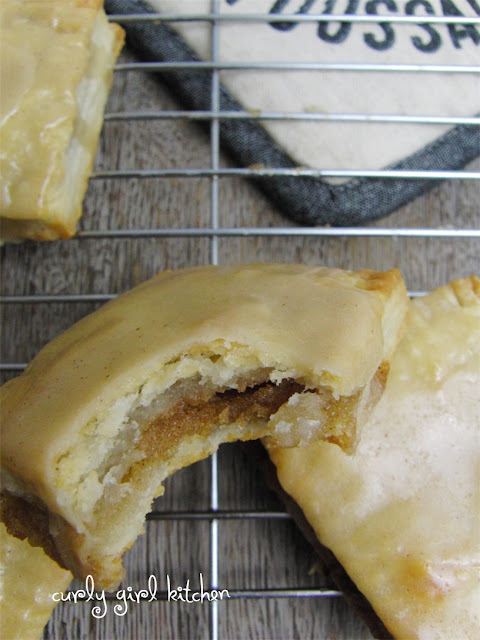 In the end, I felt like the pie crust was a more successful crust for homemade Pop Tarts than shortbread dough, so that’s what I’ve used in my recipe below. They were a lot more work than just buying a box of ready made Pop Tarts, but they were fun to make and so yummy! On a lightly floured surface, roll the dough out 1/8 of an inch thick. Cut into evenly sized squares or rectangles, at least 3x3, but no bigger than 3x5. I was able to cut 12 rectangles measuring 3x5 (for 6 large pop tarts). Set aside. Place the chopped chocolate in a bowl. Warm the cream, in a saucepan or in the microwave, just until it's gently simmering. Pour the cream over the chocolate; let stand for 3 minutes then stir until smooth. Let cool for about 10 minutes until thickened a little, then scrape into a plastic bag or piping bag. Spoon the marshmallow cream into another bag. Dip your fingers in water and moisten the edges of the dough, then place the other pieces of dough on top. Use a fork dipped in flour to press all the edges firmly together. Prick the top pieces of dough a few times with a sharp knife to vent steam. Preheat the oven to 400. Bake the chilled pop tarts for 11-12 minutes, pale until golden brown. Cool for 2-3 minutes on a wire rack. Meanwhile, combine the powdered sugar, cocoa, corn syrup and vanilla, then drizzle in a very small amount of warm water at a time, just enough to reach the right consistency for a glaze. 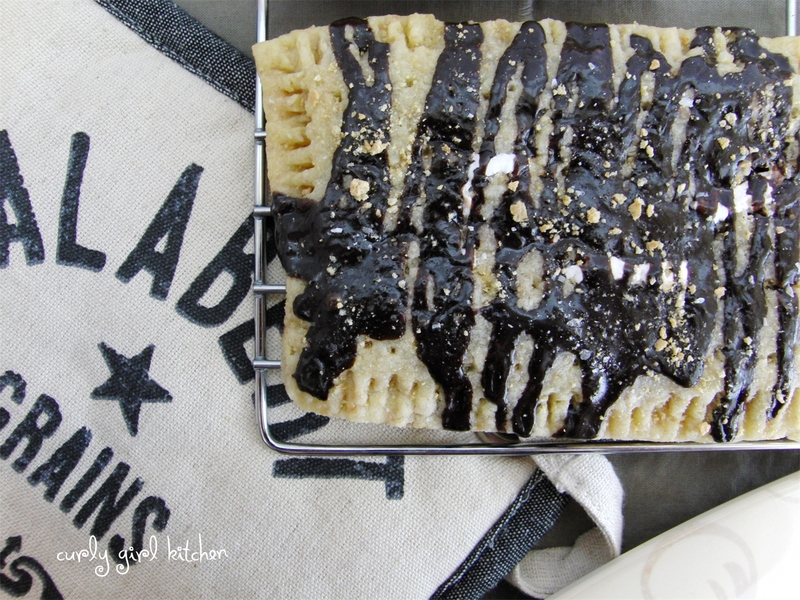 Drizzle over the warm pop tarts; before the glaze sets, sprinkle with a little Kosher salt and graham cracker crumbs. Roll out the dough 1/8 inch thick. Cut dough into squares or rectangles (I just cut 3x3 inch squares of dough, but 3x5 rectangles would be more traditional). In a bowl, combine the butter, brown sugar and cinnamon; mash with a spoon until blended. Spread about 2 teaspoons of the filling into the center of half the pieces of dough, leaving about a half inch around the edges. You should have some filling leftover. Dampen the edges with a little water, then press a second piece of dough over the top. With a fork, press the tines firmly around all the edges of the pastry to seal it, then prick the center of the dough a few times. Bake the pastries for about 11-12 minutes, until pale golden brown; the filling may seep out of the edges a little. Meanwhile, combine any leftover filling with the powdered sugar, dark corn syrup and a small amount of warm water until you have a smooth glaze. 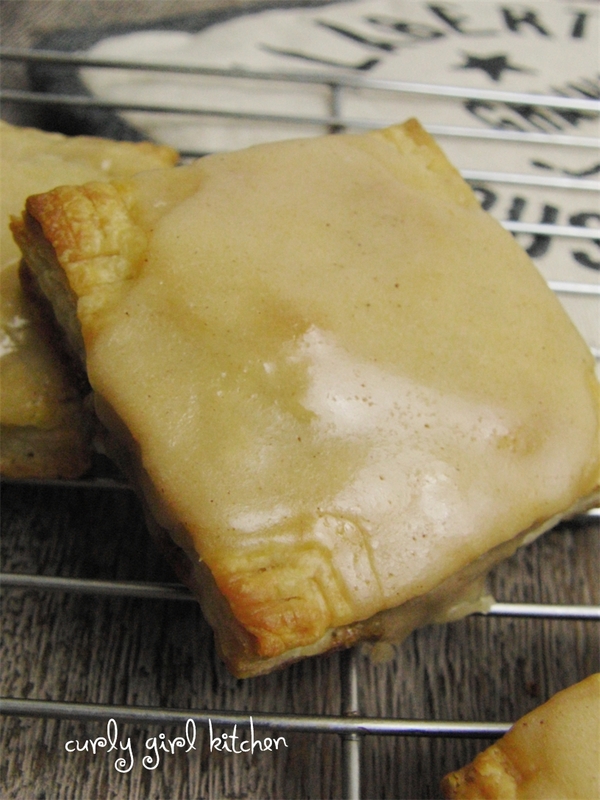 When you take the pop tarts out of the oven, cool for 2-3 minutes, then drizzle or pour the glaze over the pastries. Cool for 20 minutes then serve warm. The Brown Sugar ones tasted exactly like I remember, and the S'mores ones were pretty darn close! I was thinking if I tried them again, I might try it with rows of chocolate chips and mini marshmallows, instead of the ganache and marshmallow cream. 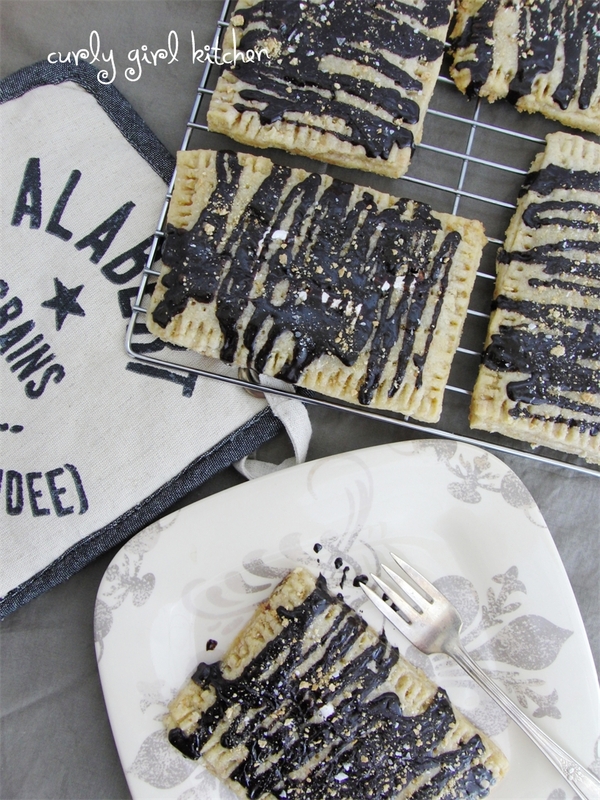 I LOVED cinnamon pop tarts growing up, so I can't wait to try these! Could I assemble them the night before so I could bake them fresh in the morning? 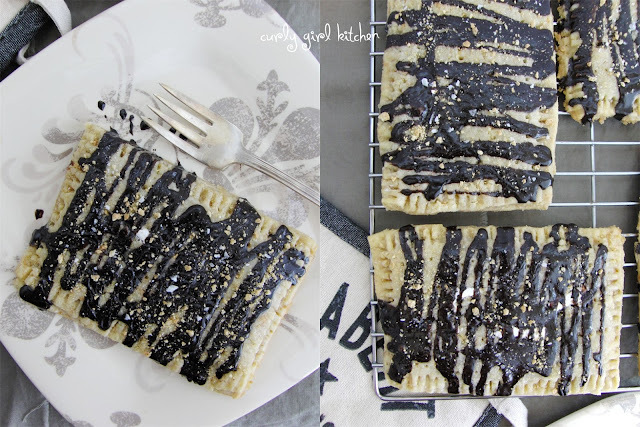 I LOVED brown sugar pop tarts growing up, so I can't wait to try these. Do you think I could assemble them the night before so I could bake them fresh in the morning?